This is a microsized, poppet type, 3-way normally closed, limit valve. 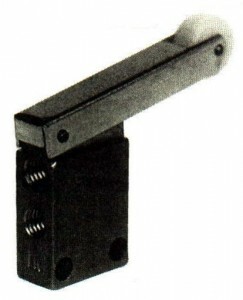 It is primarily designed for momentary contact work that requires very light actuating forces. Therefore, it does not have a 100% seal on the actuating stem. This means that, while the valve is held actuated (and only then), there is a slight bleed to atmosphere around the stem. Operating force @ 100 p.s.i. is 2 ounces. Operating Pressure 30 to 150 p.s.i.